The time, dedication, and persistence needed to become a top disc golf athlete really takes something, and we’ve seen that DD team member Zoe Andyke checks off all of those boxes and more. From learning about how she’s been involved in teaching women across the nation to understanding how her viewpoints on disc golf and life seamlessly intertwine, she’s an inspiring person to look up to no matter where you’re at in your game. Zoe is a firm believer in taking good care of your body - in fact, the word “good” permeates her motto: “Look good, feel good, play good, be good.” When it comes to health and nutrition, she has her plan dialed in and has found a way to thrive both on and off tour. Let’s take a look at her guiding principles in this final installment of Zoe’s DD Women’s Series. When you think about what it takes to play tournaments weekend in and weekend out while competing against the best in the world, there’s really no room for foods that don’t serve your nutritional needs. Alongside her commitment to keeping the bad stuff out, Zoe focuses on filling her plate with dark greens and purples, and integrates fresh items into her salads, smoothies, and meals. Add in at least 70 ounces of water a day and she’s set! With a commitment to get in some form of cardio at least 5 days per week, Zoe is able to keep her body in shape and can handle those days when she might have to play 36 holes on a Saturday. 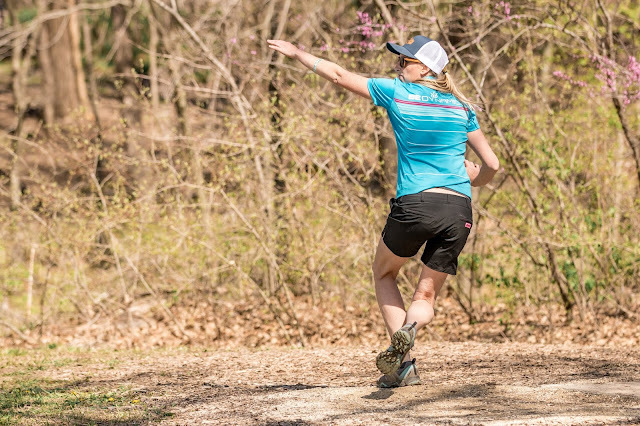 No matter what stage in life you’re at - a new disc golfer looking to learn the basics or you’re a touring pro who needs a little encouragement - the things we’ve learned from Zoe Andyke are applicable across the board. Thank you Zoe for being such an incredible ambassador for our sport!